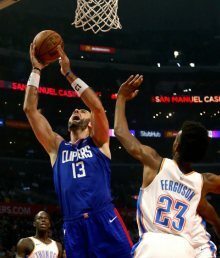 LOS ANGELES -- The Los Angeles Clippers unleashed 37 fourth quarter points to score a come from behind 108-92 victory over the visiting Oklahoma City Thunder on Friday night at Staples Center. The Clips trailed 77-71 after three quarter before erupting with a 37-15 run in the final 12 minutes. Forwards Danilo Gallinari and Tobias Harris inflicted the most damage with a 52 points and 15 rebounds. Bobab Marjanovic chipped in 13 while 3-time Sixth Man of the Year winner Lou Williams led the bench scoring with 17. The Thunder, with Steven Adams grabbing 18 rebounds with his 17 points, dominated the boards, 52-47. But the Clippers dished more assists, 21-18, and shot better from the field with 35 of 80 while the Thunder struggled mightily with a 34 of 95 clip. L.A. also made more triples, 11-7. With Russell Westbrook still nursing back slowly from a knee procedure during the offseason, Paul George assumed the top scoring chores for the Thunder. George, a former Indiana Pacer, finished with 20 points but he missed 20 of 27 shots, inluding eight of 11 from 3-point land. Alex Abrines and Raymond Felton combined for 22 points off the pine for OKC, which fell to 0-2. The Clippers improved to 1-1.